Increased Power The C.A.R.B certified (2010+ pending) COBB Tuning SF Intake removes a pre-turbo restriction in the stock intake system. The SF Intake intake system utilizes several unique features in an effort to maintain optimal flow for performance while minimizing turbulence that can cause engine management problems. From a custom conical cloth air-filter element, a CFD-designed velocity stack leads to an unique air flow straightener grid designed to smooth the incoming air flow as it passes the Mass Air Flow sensor for precise readings. The intake utilizes a one piece design constructed from a high temperature plastic composite, saving weight and reducing heat transfer. Increased Induction Sound Enjoy the increased snarl from your engine and hear the turbo spool more clearly with the addition of the COBB Tuning SF Intake system. Turbocharger induction noise and bypass valve venting sound is much more audible using this intake system. Easy to Install The COBB Tuning SF Intake was designed to be easy to install without having to modify your car. Installation requires no cutting or trimming of any components and can be completed with simple hand tools. Simply remove the stock airbox and bolt the SF intake into place in just minutes. Calibrations All aftermarket intakes for 08+ Subarus require tuning, regardless of manufacturer, in order to ensure the MAF sensor reads properly and the engine operates within safe parameters. COBB Tuning has you covered with Off-The-Shelf Maps for the Accessport, making it as easy as install, flash and go! Head over to the Subaru Accessport Map Database to view the full selection of SF Intake Maps for your vehicle. 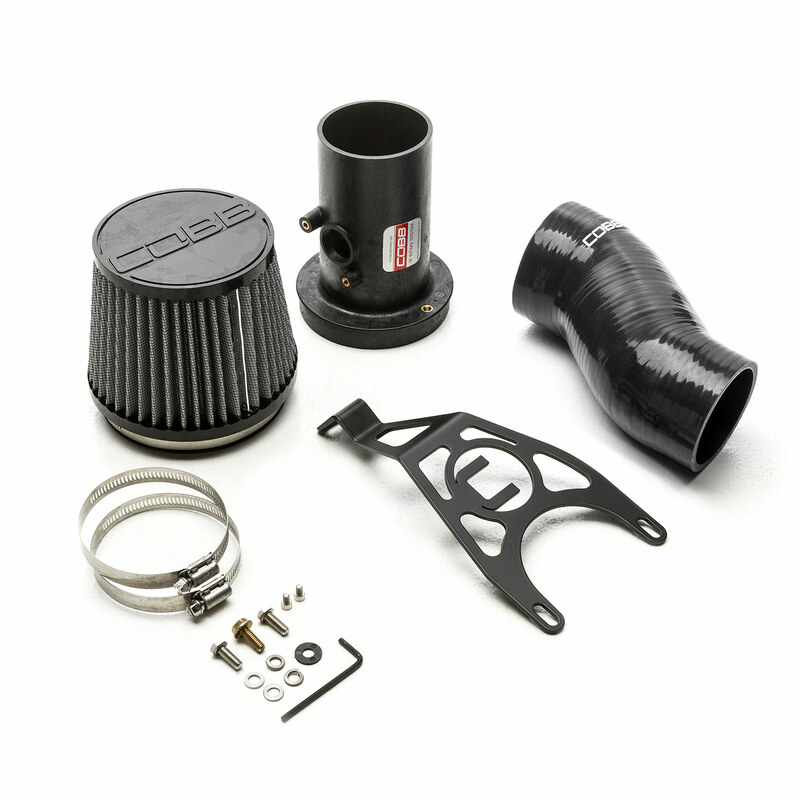 Subaru SF Intake System - Stealth Black is rated 4.8 out of 5 by 66. Rated 4 out of 5 by Blake from Good intake, but.. I have been using this short ram intake I with a custom AP tune for a while and it runs beautifully. However in order to run most front mount intercooler's, you have to trim the silicone coupler and move the intake back a bit, in order for the Piping to fit. And in doing that, you can no longer use the metal bracket that comes with it, but it stays pretty well without it anyways, so no worries there. Only reason i gave it 4 stars instead of 5. Is because it is not compatible with a front mount intercooler. However, with little bit of trimming the silicone coupler moves the intake back it will fit with no problems. Rated 1 out of 5 by David from Horrible Customer Service I made the mistake on buying the STI intake for my WRX. I realized after it already had been shipped. I requested a refund and they told me to send back. The day I got the intake, I did not unbox, I just sent it right back in the same box they sent it in. After a few days, I asked them if they had received it and they advised that there were no updates.I haven't heard from them since. I emailed twice to inquire about my refund since I sent their item back and they have yet to respond. Its been over two weeks now and I am out 195,00 after I sent their item back. I am sure there performance parts are good but I've had horrible luck with their customer service so far. Rated 5 out of 5 by SkitownWrx from Great intake if you aren't afraid of some noise I've had the AEM, modified stock box and now the Cobb sf. The Cobb is by far my favorite. My A/F learning has stayed below 3% since install. I am always surprised by the quality of the packaging when making a purchase from cobb. I'm currently on the OTS cobb stage 2 sf intake map. Catless turbo back. The turbo spool is insane. I personally love hearing all the noise my engine makes. This is not a quiet intake by any means. I will be using the airbox during the summer to avoid ambient engine heat but am currently running it without one. Never above 98°f intake temp at 6600ft. My stock box would get upwards of 134°f!